Bacon Today has an interview with NetDiva about her Bacon Man construction for the annual Bacon Fest, an "exciting potluck/party where all guests must contribute something with bacon" drawing "around one hundred people this year, mostly from the San Francisco Burning Man community." 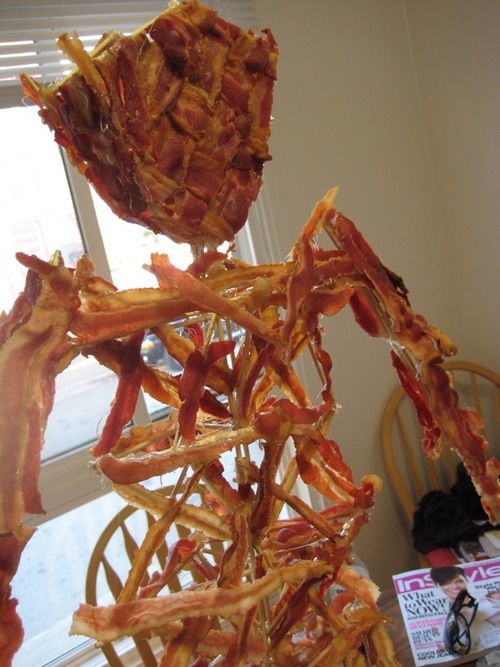 BaconMan was made from around 80 bamboo skewers, 60 hot glue sticks and 8 pounds of bacon. 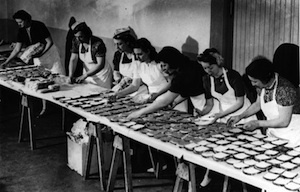 The face was made from weaving raw bacon and then microwaving it in sheets. The rest of the construction was made by first building the frame out of skewers and then gluing on cooked and cooled bacon strips. We used a piece of styrofoam for the base and covered it in fabric. And then they burned Bacon Man like the Burning Man. It's hard to see bacon not be eaten, but it's for art's sake so they get a pass.